A lot of cynical people think that I purchased Mr Graphic Foodie's birthday gift this year as a purely selfish act. 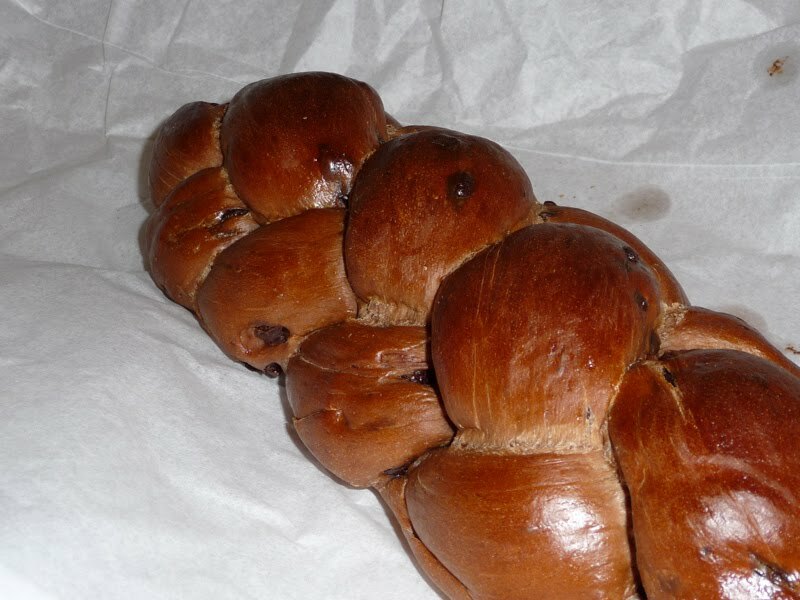 But that couldn't be further from the truth as he loves a bit of bread baking and a place on the Italian bread course at The Lighthouse Bakery school was a very thoughtful gift I say. But, I mean, it would have been a rubbish present had I just shipped him off alone to it. I had to go really. You know, for company. 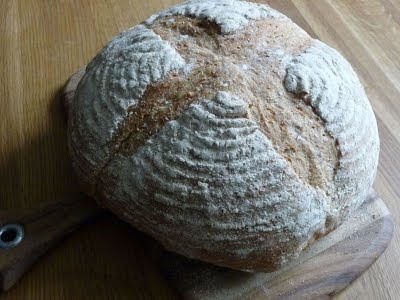 Anyway, off we both went to Bodium to the fully operational bakery for the Italian bread day-course. 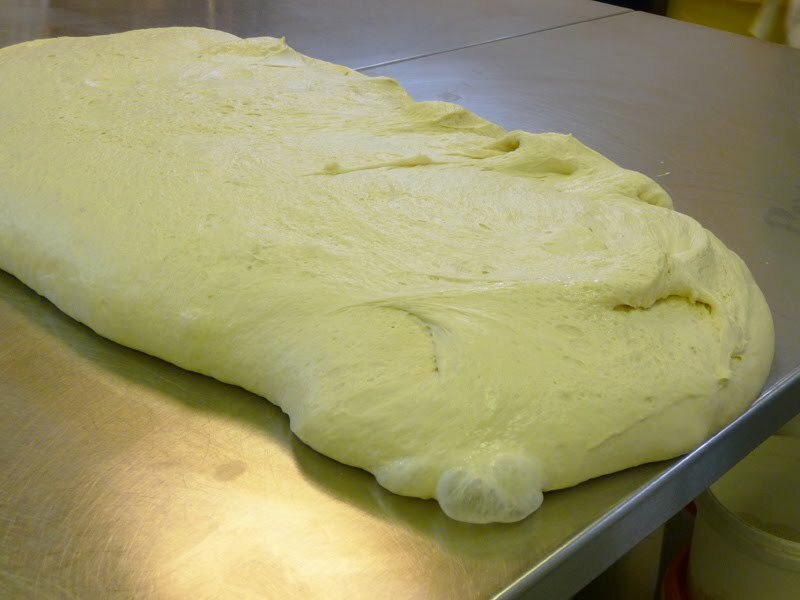 Although we had attempted, with a degree of success, focaccia and pizza at home, our full sized loaves have always been a bit on the dumpy side. I can't recommend The Lighthouse Bakery enough really. 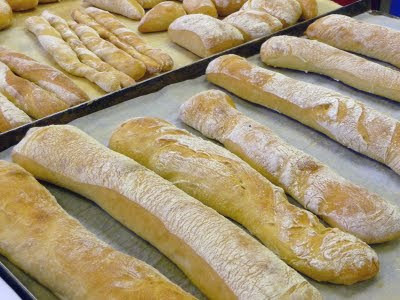 The course, although just of a single day, was a thorough foundation for baking real Italian artisan breads. Without sounding too hysterical, it really has changed our lives, even in the months since we attended. 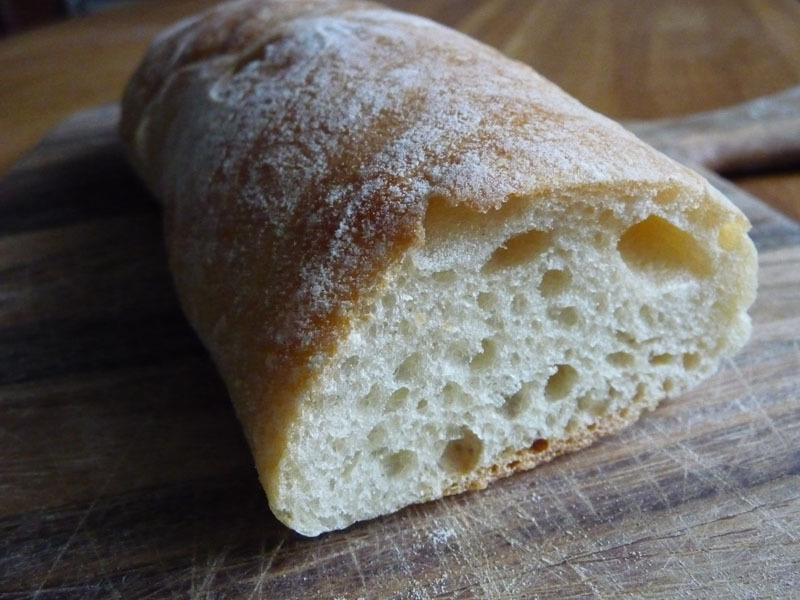 The Pugliese loaf, a big, peasant style loaf. We also made pizza for our lunch. 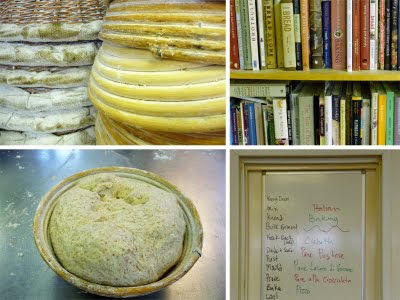 The results we are achieving at home (well Mr GF's baking really) over the four months since we attended this course have been fantastic and on Sunday's our home is scented with freshly baked loaves to feed us, family members and any visitors we may have that week. We haven't purchased a single store loaf since returning from the class. You can't get more rewarding that that. 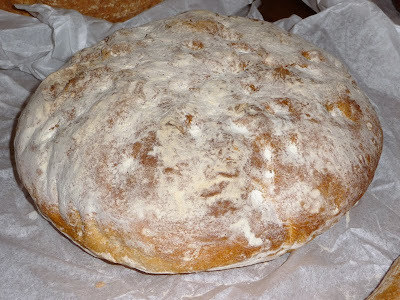 Yes, it is a bit of work but we've fitted bread making into out lives quite easily, making the bigas/starters the night before and proving and baking around 6 loaves at a time which freeze fantastically. 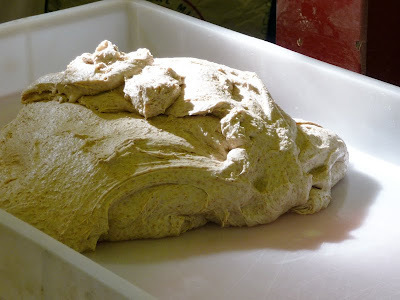 The alchemy and chemistry of breadmaking is so vital that I think it needs to be taught by an expert as they will be able to describe how a dough should feel and look at any stage of the bread creation process. A baking book could never do this, no matter how good the pictures are. It also gave us confidence in handling very wet, unruly dough mixture. Elizabeth Weisberg is a former art historian turned baker who deliveres a humerous, passionate and professsional teaching method and is a weath of bread knowledge. Amazing delivery and attention seeing as she would have already done a day's work baking the bread in the dead of night before the morning class started. She taught us about flours, processes, Italian bread culture, sayings and sciences even before we got our aprons on. It was a thorough journey and unusually I managed to absorb it all. Mr GF expressed an interest in sour dough so they even gave him some of their starter, which we christened Norris, to make pizza and breads with. We love our Norris and we have alarms set up to remind us to feed him. The biggest change is that we now create a biga the day before, a type of pre-ferment that is used exclusively in Italian breadmaking. 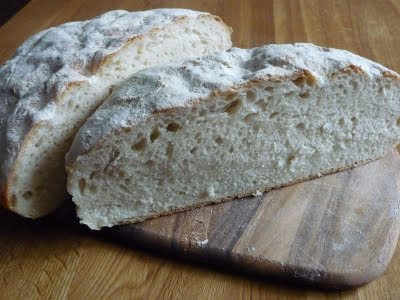 The result is better flavour and light, airy, open texture to the bread. 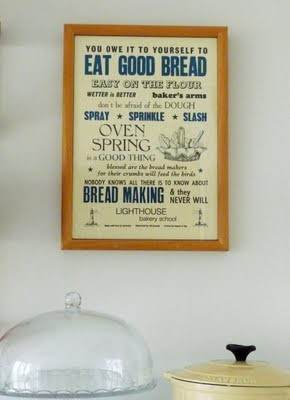 We also purchased a few key items that have helped create better breads: good electronic scales, large metal bowls, large tuppaware boxes that we use for proving, some cane banneton's, baking stones for the oven, a peel, some scrapers and dough cutters. There's a ton more other stuff we could buy but this has really set us on our way. Courses at The Lighthouse Bakery cost £175 and you can choose a variety of bread types from American, European, seasonal breads or the more traditional day-to-day breads. Price includes extensive course notes (which have been really handy), a branded apron, lunch and of course all the produce you make on the day. 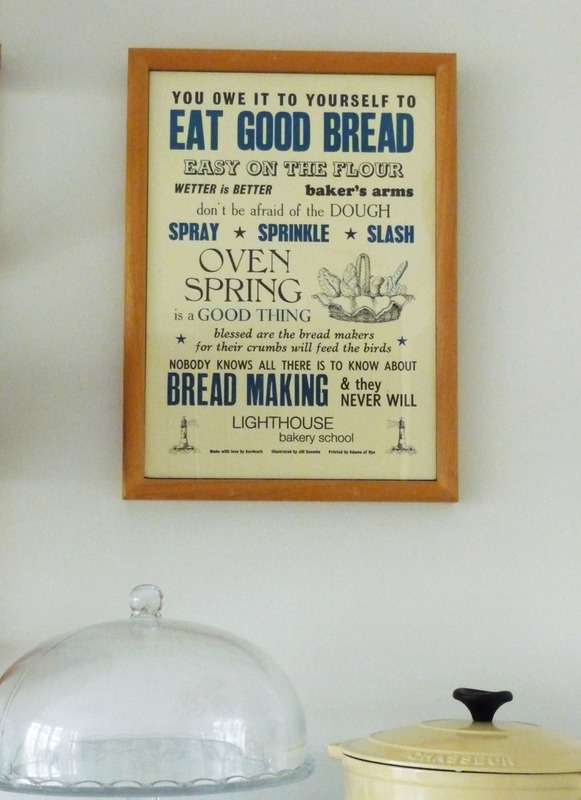 We even picked up this beautiful letterpress print, designed especially for The Lighthouse Bakery with all of their sayings by Aardvark on Sea which hangs proudly in our kitchen. You owe it to yourself to eat good bread. Yup.